- Does it now mean that it is wrong if the Forestry Commission deny riders access to the public forestry estate, charge riders but not pedestrians and cyclists and limit their access within those forests where general non motorised access is allowed ?. - Does it now mean that it is wrong if Natural England discriminates against the disabled and equestrians or a combination of both through the design and construction of bridlegates they instal on their land? . - Does it now mean that it is wrong if riders are indirectly discriminated against through the introduction of enclosure and fencing of open and unenclosed common land ? - Does it now mean that it is wrong if the introduction and construction of gates and the associated access provisions bring about a physical obstruction to a particular person or group with protected characteristics ? This could apply equally to equestrians with arthritis of the hands or the inability to remount without assistance once having dismounted due to a damaged knee as it would to a person using a cross country mobility vehicle to access the countryside. Part 3 including Schedules 2 and 3 makes it unlawful to discriminate against, harass or victimise a person when providing a service (which includes the provision of goods or facilities) or when exercising a public function. Part 4 including Schedules 4 and 5 makes it unlawful to discriminate against, harass or victimise a person when disposing of (for example, by selling or letting) or managing premises. Part 11 including Schedules 18 and 19 establishes a general duty on public authorities to have due regard, when carrying out their functions, to the need: to eliminate unlawful discrimination, harassment or victimisation; to advance equality of opportunity; and to foster good relations. This section ensures that individuals have no recourse to private law because of a failure by a public body to comply with the duty imposed by section 1. This means that individuals are not able to claim damages for breach of statutory duty for a breach of this duty. However, this section does not prevent an individual from bringing judicial review proceedings against a public body which is covered by the duty, if he or she believes the public body has not considered socio-economic disadvantage when taking decisions of a strategic nature. This section defines what is meant by the duty to make reasonable adjustments for the purposes of the Act and lists the Parts of the Act which impose the duty and the related Schedules which stipulate how the duty will apply in relation to each Part. The duty comprises three requirements the first or third requirements involves the way in which information is provided. The second requirement is the taking of steps to avoid the disadvantage which will include removing, altering or providing a reasonable means of avoiding the physical feature, where it would be reasonable to do so. How is this to be interpreted for equestrians? As always it is the duty of the courts to make definitive interpretations of Act of Parliament but it may be useful to set out some possible and potential situations as examples where this legislation may come into play. 1. The discrimination against equestrians by the Forestry Commission for access to the public forestry estate, the charging of equestrians but not pedestrians and cyclists and the limitation of access within those forests where general non motorised access is allowed. 2. 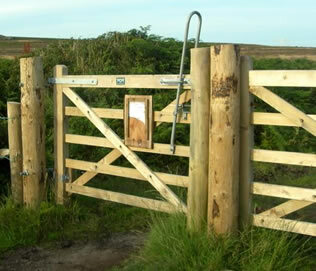 The specification and use of particular gates by Natural England and its Stewardship grant scheme which discriminates against the disabled and equestrians or a combination of both through design and construction. This applies equally to the voluntary agreement between Natural England and the Ministry of Defence in the environmental management of land held for training purposes as it does for land managed under higher level stewardship [HLS] and previously as Countryside Stewardship and the Corporation of London. It could also include the licensing of gates under s147 HA 1980 such that those gates did not discriminate against any specific or group of lawful user. 3. Indirect discrimination through the introduction of enclosure and fencing of open and unenclosed common land and manorial waste which leads to accidents [self closing gates] on the site but also where such construction has lead to increasing or new use of the highway which was not previously necessary and an accident occurs as a result of the previous use no longer being viable. 4. The introduction and construction of gates and the associated access provisions may bring about a physical obstruction to a particular person or group with protected characteristics. This could apply equally to equestrians with arthritis of the hands or the inability to remount without assistance once dismounted due to a damaged knee as it would to a person using a cross country mobility vehicle to access the countryside. It is important therefore to bring any such issues to immediate notice of the landowner, service provider, funding agency or authority with responsibility for the land. Where consent by a Minister, Local Authority or agency is a requirement then makes sure full Equality, Disability Discrimination, Environmental and Access Assessments have been carried out and are not flawed. Where these have not been produced, been ignored or disregarded then enforcement may be necessary in the end but always try to resolve the problem first and bring to the notice of those responsible their statutory duty. There are other provisions of the Act which effect equestrians but are on the whole related to general provisions such as employment, clubs and general activities which are outside the scope of this briefing note aimed at public recreation provision in the countryside.